eRecipeCards is the home for food lovers. Home for Food Bloggers who want to be found (An incredible data base of thousands and thousands of recipes), as well as a home for Home Cooks who are looking for recipes to follow or ideas to inspire their own culinary creations! BUT, if you simply want to set up an eRecipeBOX, there is no need to be a food blogger; simply a fan of food bloggers. You can store the recipes in an easy to find website. We do all the storing, filing and organizing for you. All you need is to tell us which recipes you would like to be able to revisit. To learn more about the eRecipeBOX aspect of the site, go ahead and click the lod fashioned recipe box photo below. There is an easy to follow guide in getting started, plenty of graphics and screen shots to make the process easy for you. And as always, if you have any problems, questions or issues just drop us an email at Contact@eRecipeCards.com. This page features the basics of how to navigate around the home page. Click the photo of the recipe you want more details about... the full recipe, ingredient list and the original blog post of the author. The TITLE in blue letters also links to the original blog post. The gold box with the button allows you to put this recipe as an easy to follow link in your personal cookbook. The more recipes you add, the more useful your cookbook will become. The "Submitted by" letters in blue are a link to all the recipes that user has submitted to eRecipeCards.com. You must register to create a personal cookbook. You must register to submit a blog post. 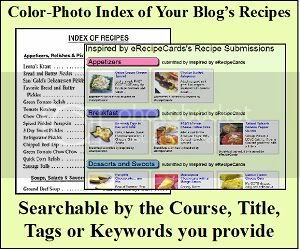 No need to own a blog if you do not intend to submit a post, but you must still register in order to create a personal cookbook. Your personal cookbook can only be viewed with your login name and private password. Posts are added and viewed on open pages daily (most recent days' submissions posted first). They are "ranked" (viewed in order) based on the numbers of people who have added the recipe to their personal cookbook, and the time they are submitted (earliest with high interest first). Readers have added this post to their personal Recipe Box!